Free music festival takes place in Mitchelstown over the August bank holiday weekend. Festival club features Giveamanakick, The Aftermath, Vesta Varro, DJ Phil Hope, RED FM DJ’s and Disconnected Disco running each night of the festival. 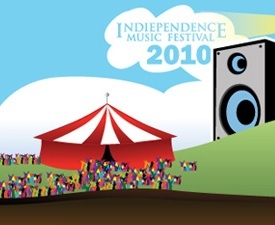 The INDIE-PENDENCE Festival will again take over Mitchelstown, Co. Cork for the August bank holiday weekend allowing up and coming independent Irish acts to play alongside recognised headliners outside the usual indie cliques. The natural amphitheatrical venue allows everyone from die-hard indie kids to sing-along music fans to enjoy the quality acts on show and all the facilities the town has to offer. Gemma Hayes, The Kinetiks, Rulers of the Planet, We Should Be Dead, The Vital Spark, Cathy Davey, Fight Like Apes, The Chapters, Giveamanakick, The Aftermath, Vesta Varro, Dirty Epics, Travega, New Amusement, Supermodel Twins, The Blizzards, Ham Sandwich, The Flaws, The Laundry Shop, Alphastates, Hope is Noise & Sweet Jane.